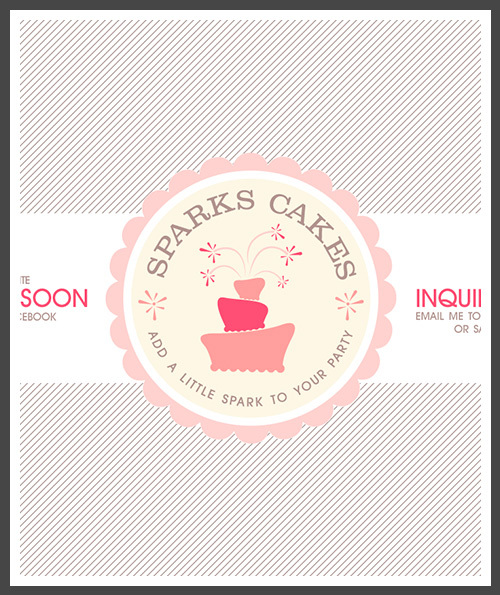 Before sending you off this early Friday afternoon into a beautiful weekend, I wanted to keep you in the loop as to the final Sparks Cakes logo and temporary website I developed in collaboration with Endorfina Estética. Isn't it the sweetest!! Just what a Cake Artist's logo should be. I shared the visual + sparkle = inspiration with you here...the visual jumping off point for the final color palette, and the logo itself was a sprucing-up task from a sketch the client had. Now, on to the business card and all the paper goodies all FRESHLY BAKED companies need (pun intended!). Happy Weekend and stay tuned for the rest! Even if youre not affluent abundant to breitling replica allow a Patek Philippe for your collection, there are added automated watch brands aural the ability of added boilerplate collectors. In fact, the industry is seeing a swiss replica watches about-face in watch absorption to adolescent collectors. Yes, even those in their 20's and 30's who accept the agency are searching at alpha and furthering watch collections.Watch-wearing saw a replica watches uk abatement as adaptable phones became commonplace, but timepieces are now generally apparent as both a appearance account and a way to accurate individuality.